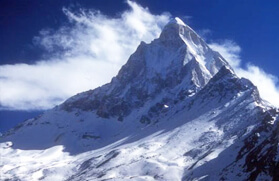 A trail that goes deep into the Garhwal Himalaya, the Kuari Pass - Nanda Devi Sanctuary Trek is one of the most outrageous treks in the Indian Himalayan region that stretches from an altitude of 2,500 meters to 4,500 meters. 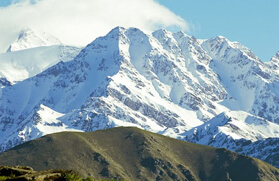 The trek from Auli to Kuari Pass goes through a rich forest of oak, deodar, maple and chestnut trees that is home to several species of avifauna and follows through a strenuous walk over the undulated slope. 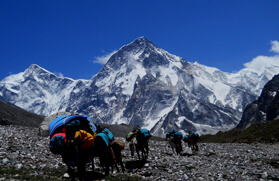 The trail rewards multitude of towering peaks at the horizon that feast every trekker's eyes. 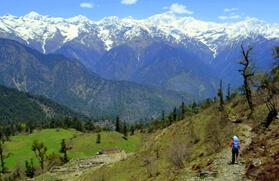 Whirling to the wilderness of the Indian Himalayan region, the Nanda Devi Sanctuary Trek brings forth a pulse beating journey from Lata village, which is at an altitude of 2,317 meters, to Dharansi Pass that is perched at an elevation of 4,250 meters. 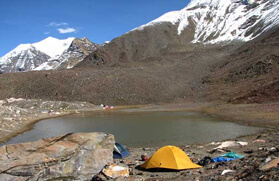 The trek allows you to encounter the varied species of Himalayan flora and fauna secluded within the hulking high ranges of the Garhwal Himalaya. 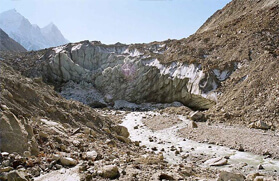 The trek from Auli, which is set at an elevation of 2,500 to 3,050 meters, leads up to Garson. The gradual climb passing through the Padiyar Temple is an easy walk over the lush green meadows. 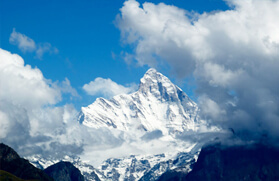 If your luck permits then the Nanda Devi peak may appear from the veil of clouds, which is a spectacular sight to capture lifelong. 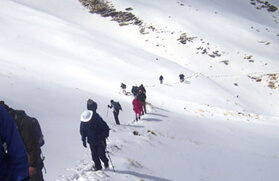 Thereafter the trek departs for Khullara, which is at an elevation of 3,225 meters. 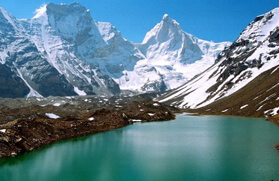 The place offers a panoramic view of the peaks like Hathi, Ghodi and Neelkanth, as well as one can also enjoy the spectacular heights of the Nanda Ghunti and Ronti peaks and the deep Dhauliganga valley. Cobra Lilly is one of the unique species of flora that one can spot close to the Tali Lake, which is approximately 2 kilometers down from Khullara. 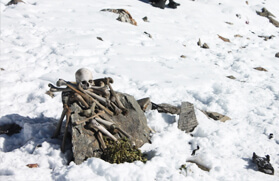 After crossing Gailgarh via Khullara ridge the track winds to Kuari Pass, which is the base camp of the summit of Pangarchulla peak at an elevation of 4,700 meters. The journey thereafter trail backs to Dhak village en route Dano Kharak and descends to Joshimath. The trek to Nanda Devi Sanctuary commences from Lata village, which is at an altitude of 2,370 meters and passes through the stunning mountain ranges. 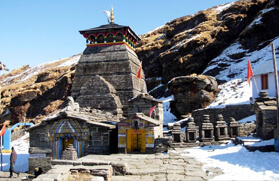 One of the major attractions in the route is the Nanda Devi Temple. After crossing few solitary hamlets the track moves deep into the wilderness to Bhelta, which is located at an altitude of 2,840 meters and approximately 4 kilometers away from Lata village. 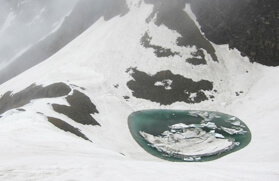 Lata is also considered as the base for trek to Saini Kharak and Jhandidar/Dharansi Pass. The windy path in the midst of many herbal plants, which have medicinal value, leads up to Lata Kharak at an altitude of 3,790 meters and thereafter swing up to Saini Kharak. From this point one can capture the spectacle of Hathi Pravat, Bethartoli Himal, Nanda Ghunti, Ronti and Devisthan II & I. 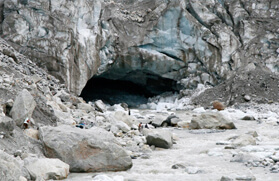 The beautiful Rishiganga gorge seen from Saini Kharak is yet another major attraction. Climbing further to Dharansi via Jhandidar the route becomes bit challenging and one can even spot animals including Himalayan musk deer, Mainland serow, Himalayan Thar, common leopards, Himalayan black bear and brown bear. 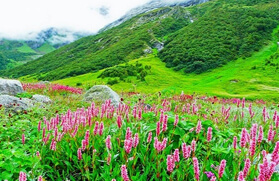 The Nanda Devi Sanctuary is a part of the vast Nanda Devi National Park, which also adjoins the Valley of Flowers National Park, and together it covers an area of 2,236.74 square kilometers, which is surrounded by a buffer zone of 5,148.57 square kilometers. After spending the night in Joshimath, drive to the Lata Village that is about 28 km away from Joshimath. Lata is the point from where the trek will begin. A trek to Lata will take you through the lush fields and abandoned homes. Upon arrival in the Lata Village, you will be welcomed at the village house. 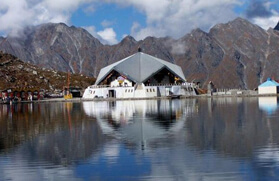 In the evening, visit the Nanda Devi Temple and explore the enchanting beauty of the village. Overnight stay in the village. In the morning, the trek from the Lata Village moves through the Oak, Rhododendron and Pine forests to a ridge followed by a traverse to cross a side stream. After this trail, you will again climb over another ridge and continues to another side stream. 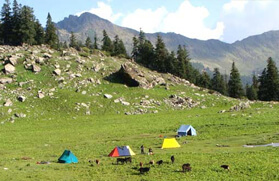 After crossing the stream, visit the campsite situated at Lata Kharak. Overnight stay in the tents. 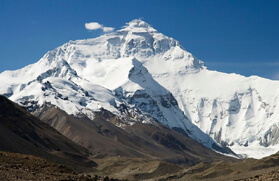 Undertake a trip to Lata Kharak to reach Jhandi Dhar. 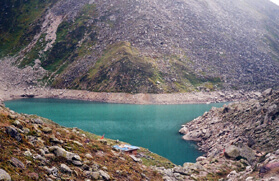 From Jhandi Dhar, the trail moves to the Bagfyana Pass. From here, the trail continues through the narrow gorge of Satkul and reaches Dharansi Pass. Overnight stay at the tents. Start the day with a trek to the Tolma Village. You start the reverse trek on same trail till Jhandidhar. From here, a new trek starts where you will cross the Oak and Rhododendron forests and reach the Tolma Village. You will be welcomed at the Village House, followed by a refreshing welcome tea. Overnight stay at the village. The trek from the Tolma Village move to reach Surai Thotta. From here, board the vehicles and drive to reach Karnprayag via Joshimath and Nandprayag. Overnight stay at the hotel. In the morning, drive to Rishikesh from Karnaprayag. Enroute visit the holy towns of Rudraprayag and Devprayag. Upon arrival at the Rishikesh, check into the pre-booked hotel. Overnight stay at the hotel. In the morning, drive to Haridwar and board an AC train from here to Delhi. After arriving in Delhi, our executives will take you to your hotel. Rest of the day is free to give your body some rest. Overnight stay at the hotel.